Red Canoe Bookstore Cafe, 4337 Harford Road, ,a great opportunity to find that one-of-a-kind gift! 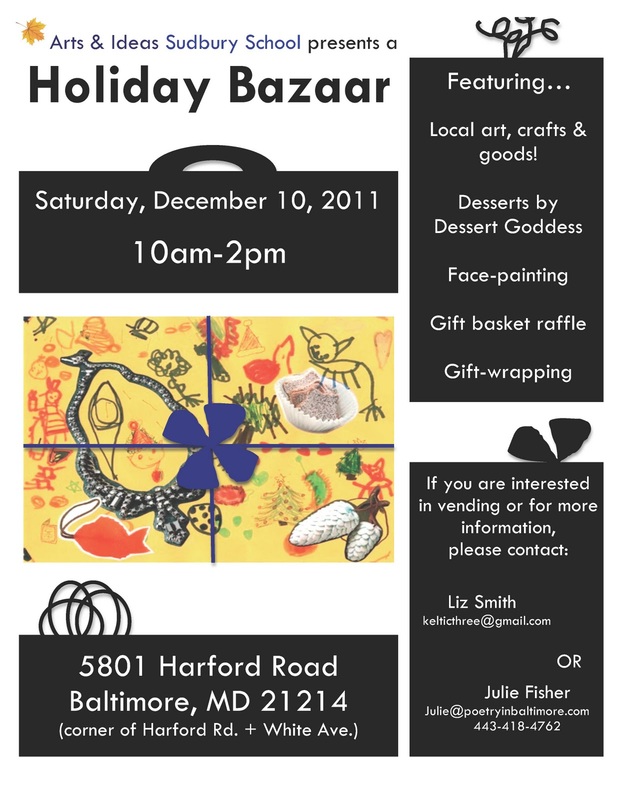 Studio C, 4337-B Harford Road - beautiful jewelry, clothing, handbags, candles, gift certificates & so much more! Koco's Pub, 4301 Harford Road - lunch, dinner, gift certificates - why not ship a crab-cake to that special friend? Tooloulou's, 4311 Harford Road - lunch, dinner, coming soon! Psychic Gallery, 4313 Harford Road - crystals, oils, small gifts. Beth's DIY, 4315 Harford Road - give the gift of a workshop class! Stop in & see what DIY has to offer. Chop Shop, Blue Spark Barber, 4321 Harford Road - get your style on for the holidays & pick up a gift certificate for a friend! Coming soon! 4323 Harford Road - Clothing! Accessories! Watch for the 'Open' sign soon! 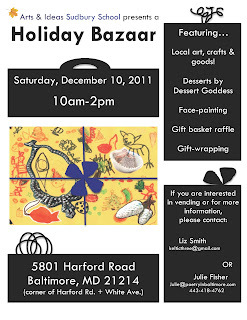 Charmed Life Studio, 4505 Harford Road - artwork, gift certificate & more! 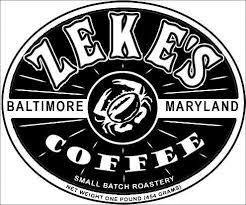 Zeke's Coffee, 4607 Harford Road - small batch coffee by the pound, loose tea, local products, gift certificate! And, more great gift ideas - join a class, give a gift to a friend! Visit more shops in Lauraville! TruAx Custom Frames, 4711 1/2B Harford Road - opening soon! Soft Touch Photography, 5123 Harford Road - beautiful family portraits, gift certificates - right in your neighborhood! The shopping & gift opportunities continue in Hamilton! Clementine, 5402 Harford Road - breakfast, lunch & dinner or give a gift certificate to a friend! Hamilton Bakery, 5414 Harford Road - bread, desserts, coffee made fresh daily, special orders, gift certificates! Hamilton Vacuum, 5421 Harford Road - clean up for the holidays, or give the gift of clean to someone on your list! Crystal's Bridal, 5424 Harford Road - Not just for brides - clothing for special occasions, too! Hamilton Gallery, 5502 Harford Road - framed & un-framed artwork, cards, jewelry, hand-knitted clothing & more! Los Amigos, 5506 Harford Road - lunch & dinner - gift certificates! Lost in the 50s - 5510 Harford Road - breakfast & lunch - gift certificates? Hamilton Tavern, 5517 Harford Road - gift certificates! Studio 55, 5529 Harford Road - art lessons, beautifully framed artwork, a great long-lasting gift! Mid-Atlantic Center for Performing Arts, 5543 Harford Road - give the gift of dance to a youngster in your life! The Diva Shop - 2916 Hamilton Avenue - jewelry, handbags, watches, shoes, clothing, fragrance, men's accessories & more! All this & more - all here in Lauraville and Hamilton . Don't forget that certificates for groceries, health & beauty supplies. Thanks for bringing great music to the neighborhood!" This November 26th is the second annual Small Business Saturday, when people across the country come out and shop to support their favorite local businesses. 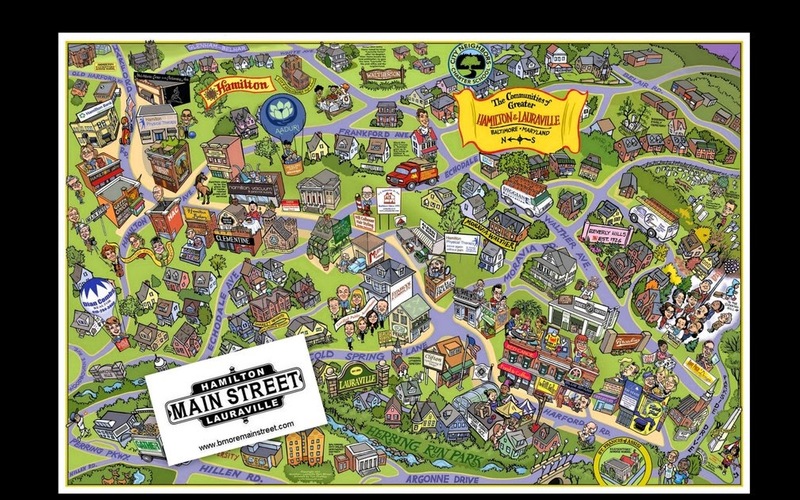 The businesses at Hamilton-Lauraville Main Street have some great shopping opportunities for you! Look for unique selections to fulfill your gift lists. Enjoy the friendly atmosphere & close-to-home convenience that shopping locally provides! 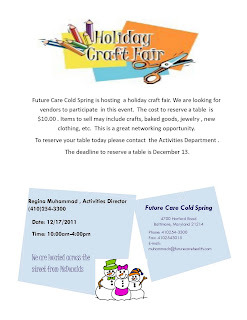 Future Care Cold Spring is hosting a holiday craft fair. 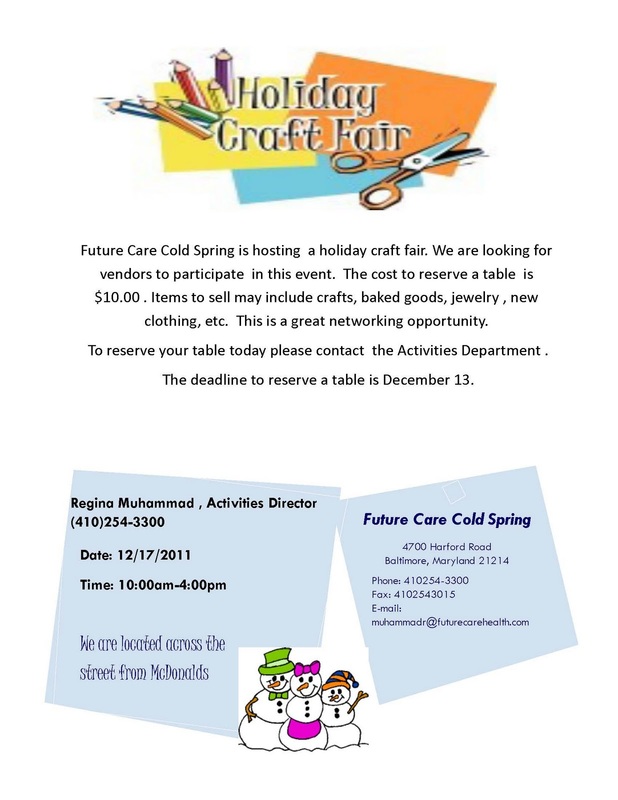 We are looking for vendors to participate in this event. The cost to reserve a table is $10.00 . Items to sell may include crafts, baked goods, jewelry , new clothing, etc. This is a great networking opportunity. To reserve your table today please contact the Activities Department . The deadline to reserve a table is December 13. Visit your favorite neighborhood shops on SMALL BUSINESS SATURDAY, November 26th! Browse around for great unique gifts right in your own backyard! Although our list is comprehensive, please check with your fav Harford Road business for more information. And, while you're in the neighborhood, be sure to check out all the indie shopping opportunities in Lauraville! Gift certificates? Jewelry? Clothing? Handbags? Candles? Books? Artwork? Small batch coffee by the pound? Massage? Yoga? Skin Care? Great Hair? You can find it all HERE! Park you car, ride your bike or walk .... everything is conveniently located! 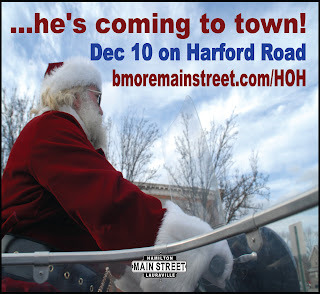 Click on Santa's picture for details of his visit on Dec 10, 2011 to Harford Road in Lauraville and Hamilton. This is a RSVP-Only event; email to reserve your seat now! Google has a new free perk for business owners in targeted cities who want to get a 360 view of their business interiors on their Google Places listing. It is pretty cool. Each business has to apply. Baltimore is one of the target markets right now. Check it out. Aaduri Healing Arts invites you to check out our new location! Please stop by our open house, we'll have food and drinks and we'll be showing the photography of Millicent Hoffman! 4705-A (1st Floor) Harford Rd. Parking available in adjacent lot. 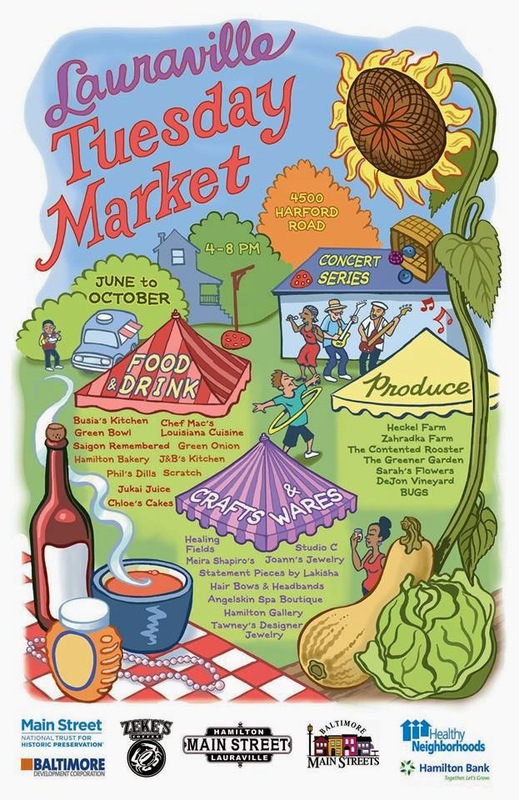 Beer and wine will be served and Red Canoe will be providing us with some yummy treats! There will be Free Chair Massages and also a Raffle for a free 60 minute massage. 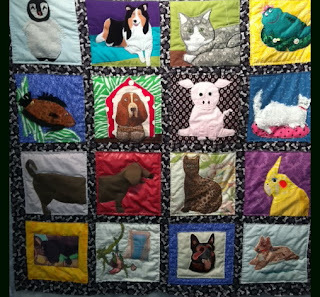 The members of the Hamilton Quilt Circle recently finished their BARCS quilt, which was recently part of the BARCS fund raising efforts and raised $500 for them! Way to go! Hamilton-Lauraville Main Street is planning its 4th Annual Holidays on Harford Road. 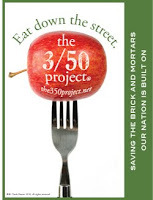 Its our effort to bring the community to the commercial district. Please save the date and stay tuned to our website & blog for updated information. Nominated for Best Blues Band, Blues Instrumentalist and Blues Vocalist by the Washington Area Music Association! New CD “Under the Influence”! Autumnal Eats: Hamilton Tavern is pub-style food that is comforting and special, familiar and slightly surprising.